This Crock Pot Vegetable Soup Recipe gets a lot of action around our house in the fall. 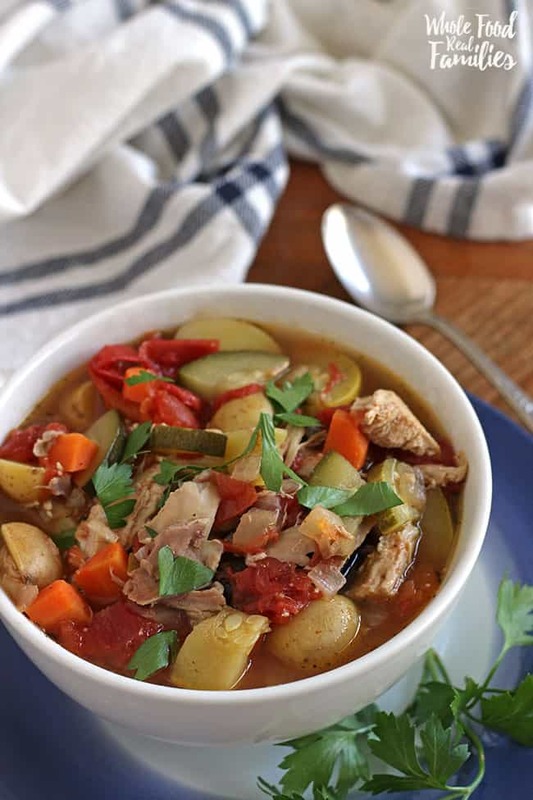 In addition to being warm and hearty, I can flex this recipe based on the produce I have on hand, the starch I want to include, and can add chicken or turkey to make it a complete meal. I make it with the veggies I have in my produce drawer more often than not. If I only have a little bit of something, it gets thrown in the slow cooker along with everything else. So the ingredients tend to change from season to season. I add loosely chopped leafy greens when I have them. I use homemade chicken stock or store-bought. 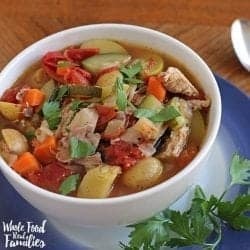 If I make a Whole Chicken in the Crock Pot, I use the leftover meat from the chicken(s) to make the broth but first I remove all the leftover chicken (like the dark meat on the back that nobody seems to eat) so I can throw it in the Crock Pot with the vegetables after the stock is complete. This soup freezes GREAT! We divide it out into meal size portions – or even lunch sized portions – and freeze it for later. If we are using it for lunch, I just reheat it in the morning before school and add it to a thermos and it is still hot at lunch. If you want to add pasta or rice, I just add it that morning. Make Your Own Stock for Slow Cooker Vegetable Soup? Add a sprig of thyme, parsley, and a bay leaf to the pot, and add any veggies you need to use up! I always start with a couple of carrots and an onion but have used everything from celery, leeks, zucchini – even the fronds from the tops of carrots I bought at the Farmers’ Market. Fill your crock pot the rest of the way up with water, leaving an inch at the top, turn the slow cooker on low, cover it, then go to bed. You will wake up with excellent chicken stock! 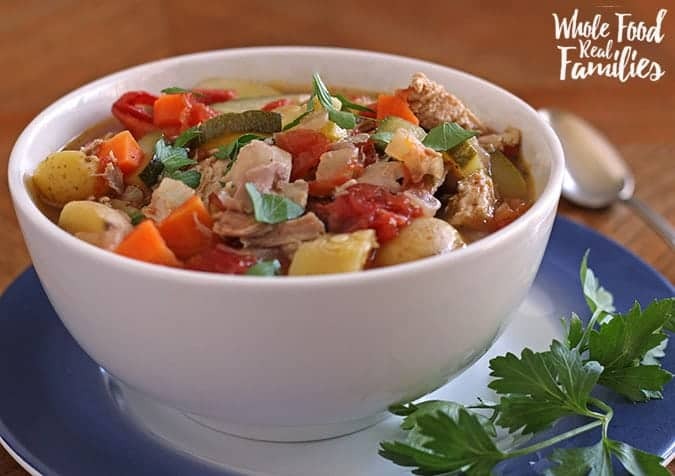 It is flavorful, delicious and the perfect base for this Crock Pot Vegetable Soup recipe! Make sure you strain the stock and all the cooked veggies and throw them out before using the stock. It is Always Soup Season when the Recipe is this EASY! I am so glad it is soup season. But honestly, I live in Savannah, Georgia. I always giggle a little when I read posts that talk about summer being too hot to turn on the oven. Our summer runs from early March to the end of November. If I didn’t turn on the oven in summer, my family would starve. So if I reserved soups for the heart of winter, I would miss out on a world of yummy opportunity. 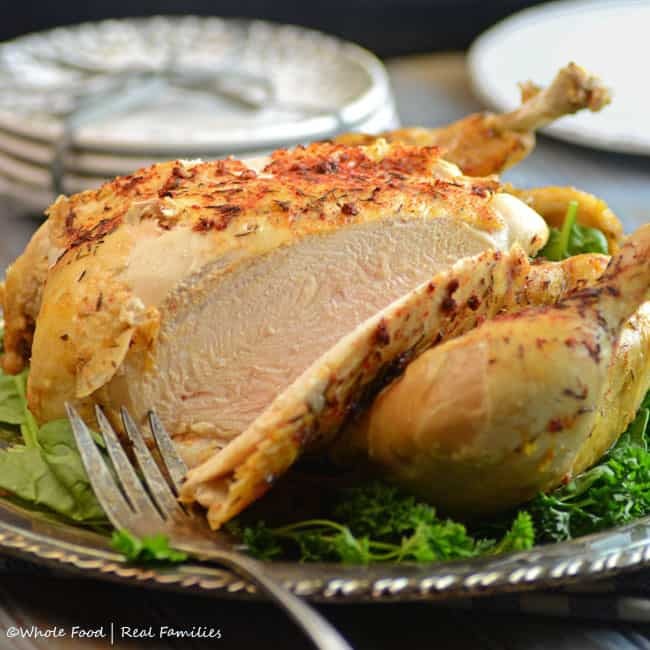 Were you tempted by all this talk of a Whole Chicken in a Crock Pot? You can get that recipe here! 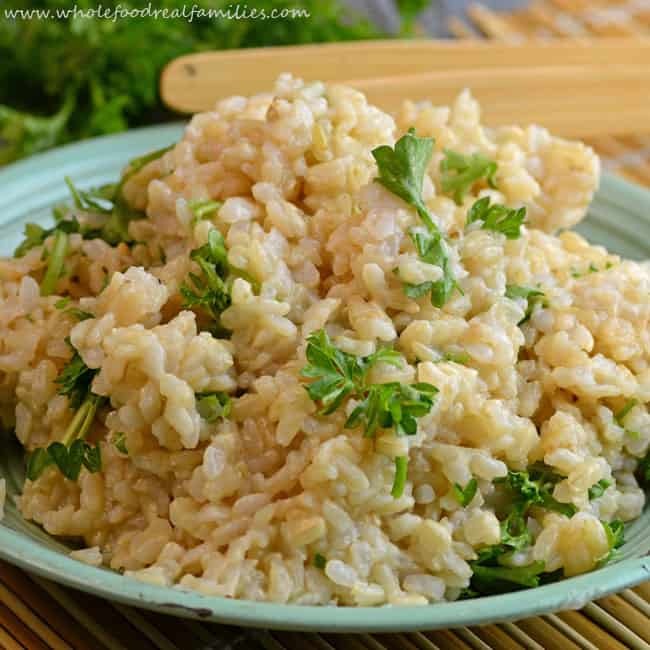 We love this Herbed Brown Rice with it and use up the leftovers with the Crock Pot Vegetable Soup recipe! If you are making your own broth after the recipe Whole Chicken in a Slow Cooker, make sure you strain any bones, used vegetables and sprigs of herbs from the broth. Feel free to start with store-bought broth. Once broth is hot in the slow cooker, drop the chicken into the simmering broth for 20 minutes or until it is cooked through. While chicken is simmering, dice all vegetables into bite size pieces. Drizzle olive oil into a large, deep pan. Once olive oil is shimmering but not smoking, add garlic and let it cook for one minute stirring constantly to prevent burning. Then add diced vegetables to the oil. Allow the vegetables to begin cooking. Stirring in the pan occasionally so they don't burn. Once chicken it cooked through, remove from broth with tongs. When chicken is cool enough to handle, dice or pull into bite-sized pieces and add to vegetables. Stir to combine. Cook vegetables 8-10 minutes or until the carrots just begin to become tender, add a cup of the hot broth to the pan and stir, scraping the bottom to pull up any bits that have stuck or browned on the bottom of the pan. Scoop mixture and broth back into the slow cooker and add tomatoes. Allow to cook for 2-3 hours on low until vegetables reach your desired tenderness. Salt and pepper to taste. Pour finished soup over cooked rice, pasta, or quinoa if desired and serve! Or allow the soup to cool and ladle it into jars to freeze. Thaw frozen soup in the refrigerator overnight and heat to serve.